The Vienna Bus Terminal Stadion Center is the most modern bus station in Vienna and can be reached by public transport as well as by car. For events at the Ernst Happel Stadium, at the Ferry Dusika Stadium or at Krieau, the Bus Terminal Stadion Center is the perfect parking area for busses and offers a convenient access and entry point for your guests and customers. 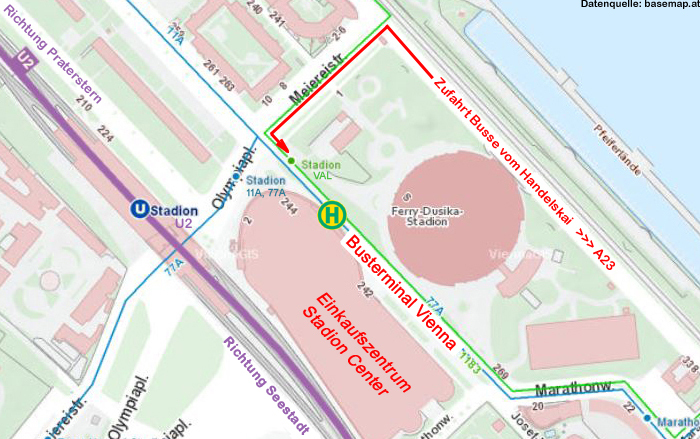 By car, the Bus Terminal Vienna Stadion Center can be easily reached via the Handelskai (between Meiereistrasse / Engerthstraße and Marathonweg). 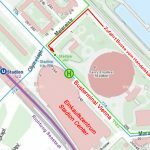 Centrally located in the 2nd district of Vienna, the Bus Terminal Vienna Stadion Center is found via the subway line U2, station “Stadion” (Exit Ferry Dusika Stadium) as well as via the bus lines of the Wiener Linien 11A (station “Stadion”) and 77A. During the opening hours of the Stadion Center shopping center, Monday to Wednesday from 9 am to 7 pm, Thursdays and Fridays from 9 am to 8 pm, Saturdays from 9 am to 6 pm, there are approx. 70 shops and restaurants located right next to the bus terminal for your enjoyment. Toilet facilities can be found at the U2 subway station “Stadium”. Open from Monday to Sunday from 00:00 to 24:00. The shopping center Stadion Center also offers the possibility to park for 3 hours free of charge. For bus companies the Bus Terminal Vienna Stadion Center is the perfect parking space for events at the Ernst Happel Stadium, at the Ferry Dusika Stadium or at Krieau and offers your customers a convenient starting and entry point. Price: € 10, – / 30 Min. (7 pm – 9 am): € 5, – / 30 Min.